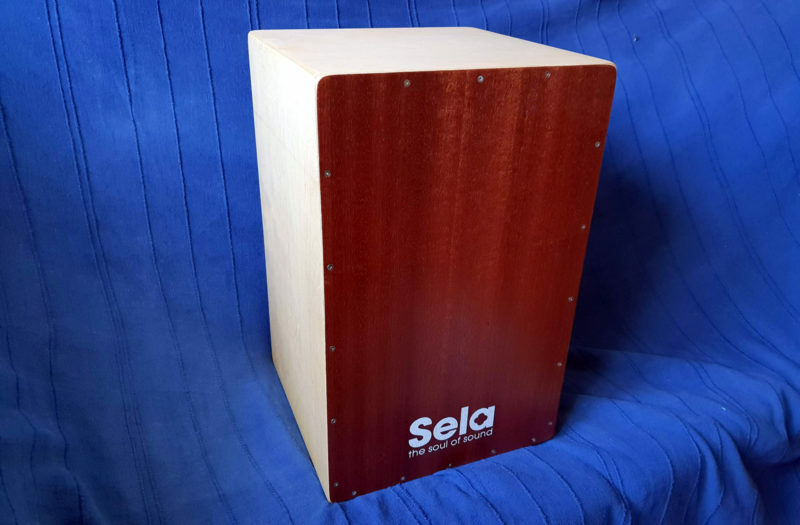 Allow me to recommend the Sela SE 001 Cajon Kit! It’s a fun project, and if you do a reasonable job you end up with a very decent cajon. It’s £55 on Amazon. You get all the parts for the cajon, plus almost all the tools and materials needed for the build, including: glue, brush, cargo straps, 3mm drill bit, T10 screwdriver bit, sandpaper and sanding sponge. Everything in the kit is high quality. You just need a screwdriver. Assembly is very straightforward. You basically glue the side pieces and strap them together, screw on the back and front panels, then do lots of sanding. It’s not much more complicated than that. The build took me about three hours at a very relaxed pace. The instructions in the box are good, but it helps to watch the instruction video on YouTube as well. (German with subtitles.) I wouldn’t have known about the ‘clap’ corners without watching the video. I wiped on a layer of Danish Oil with a cloth, then left it for six hours. Same again, and another six hours. After another six hours, I applied a final coat of Danish Oil with the cloth to bring it up to a great glossy shine. It’s worth noting that Danish Oil takes a long time to fully cure. The cajon was playable a day later, but it took a couple of weeks to fully dry. This is a really good cajon! As long as you do a reasonable job of building the kit, you’re getting a very good instrument for less money than even the cheapest pre-made options. It is possible to go cheaper. The Meinl MYO-CAJ kit is only £31. But having played the SE 001, I’d strongly recommend spending the extra money. Maybe you don’t need all the tools and materials included in the Sela kit, but the upgrade to having a proper snare makes a decisive difference. I’d actually be more tempted to upgrade to the Sela SE 002. It’s twice the price, but I like the look of the rounded edges and the more exotic playing surfaces. No regrets, though. I think the SE 001 is the sweet spot for price and quality. There’s no way you’ll get a better cajon for less.